In conversation with Dan O'Neill at Yachtzoo, I learn that Darrell Hall's central agency listing, Feadship's 50.3m motor yacht Sweet Pea, has had a swingeing $6.5 million price cut. Launched in 2000 and refitted in 2006 and 2008, this superyacht's Donald Starkey interior accommodates 12 guests in a master, two doubles and three twins, along with 11 crew. 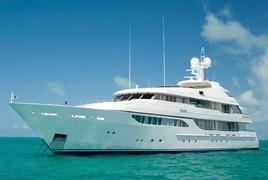 Sweet Pea will be on display at the Palm Beach Boat Show on March 25th-28th and is now asking $33 million.